Biotech Juggernaut: Hope, Hype, and Hidden Agendas of Entrepreneurial BioScience relates the intensifying effort of bioentrepreneurs to apply genetic engineering technologies to the human species and to extend the commercial reach of synthetic biology or "extreme genetic engineering." In 1980, legal developments concerning patenting laws transformed scientific researchers into bioentrepreneurs. Often motivated to create profit-driven biotech start-up companies or to serve on their advisory boards, university researchers now commonly operate under serious conflicts of interest. These conflicts stand in the way of giving full consideration to the social and ethical consequences of the technologies they seek to develop. Too often, bioentrepreneurs have worked to obscure how these technologies could alter human evolution and to hide the social costs of keeping on this path. 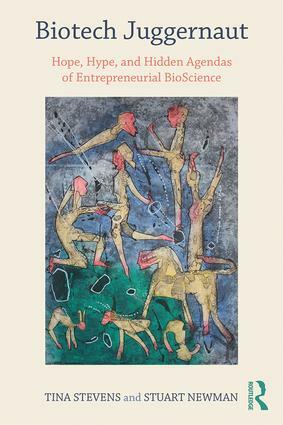 Tracing the rise and cultural politics of biotechnology from a critical perspective, Biotech Juggernaut aims to correct the informational imbalance between producers of biotechnologies on the one hand, and the intended consumers of these technologies and general society, on the other. It explains how the converging vectors of economic, political, social, and cultural elements driving biotechnology’s swift advance constitutes a juggernaut. It concludes with a reflection on whether it is possible for an informed public to halt what appears to be a runaway force. Tina Stevens, Ph.D., is Lecturer Emerita at San Francisco State University, Department of History. She is a co-founder of Alliance for Humane Biotechnology, and the author of Bioethics in America: Origins and Cultural Politics (Johns Hopkins University Press, 2000). Stuart Newman, Ph.D., is Professor of Cell Biology and Anatomy at New York Medical College where he studies developmental and evolutionary biology. He was a founding member of the Council for Responsible Genetics and is co-author of Biological Physics of the Developing Embryo (Cambridge, 2005). He is editor of the journal Biological Theory (Springer).